It seems like I might just be crossing another point off of my list in the near future: #21 “learn Krav Maga”. As the stresses of graduate school (it’s grant writing crunch time at the moment) and work begin to intensify, I’ve found that my anxiety has begun to creep up on me. Without outing certain people, individuals close to me have become irritants and a consistent source of frustration. Needless to say, I’d rather not hold onto anger and let frustration pass over me like water (that sounded deep). Meditation has helped, but I really needed some form of a physical outlet. I needed to let some frustration out, exercise more, and push myself to see what I can do. Krav Maga was the answer. I’ve been curious about Krav Maga for a couple of years now, curious enough to make it #21 on my list of “100 things I want to do before I die”. I have a slight background in martial arts/combat systems. I studied taekwondo as a kid, Kendo for 4 years, some archery, and medieval swordsmanship ..yup longsword! But none of these could have prepared me for my first day at Krav Maga Toronto. It’s the most explosive and aggressive combat system that I’ve studied. Right from the get go, you’re thrown into an intense workout. The instructor is barking commands as sweat dripping into your eyes as you throw countless knees and punches at mats. It was exhilarating. An experience like no other. I won’t lie, minutes before the class started I had my doubts. I thought, “Daniel, you can back out now and no one will know”. But then it hit me, “I’ll know. I came here to test myself and see what I can do. I put this on my list and that means I believe that it’s attainable”. I stepped into that gym, gave it my all, did pretty well, and never backed down. Once it was over, I didn’t feel relieved. I actually felt a bit disappointed. I wanted more! The official hand-to-hand combat system of the Israeli Defence Forces had me hooked. I bought a one month membership and returned as soon as I could! What did I learn? Don’t hesitate to try something new; you might just pass over the opportunity of a lifetime. Why waste this life not loving? I’ve been following the work of Wong Fu Productions for a couple of years now. Their work is incredible. It’s that simple. Learn from your experiences; good and bad. Go out and see the world. Try something new. Meet someone new. I won’t lie. Although not quite, but primarily out of dissatisfaction, I’ve put a lot of effort into distancing myself from my past. But recent events have taught me that reconnecting with my past might not be such a bad idea. I’ve written about outgrowing old friends, but this is a different case. For some reason, I’ve completely cut ties from people I knew. Some good friends; others casual acquaintances. They weren’t bad to me. They didn’t hurt me in any way. So why? In my mind it was simply because I don’t feel like I enjoyed that specific part of my life. But is this really right? Inadvertently rekindling a friendship with a good friend from high school has made me realize that it was perhaps a mistake to attempt to erase my past. I might not have enjoyed said chapter in my life, but why blame these people?I’m going to try to be a bit better at this. Don’t blame people for bad experiences in the past (unless they’re directly involved haha). Rediscovering your past might do wonders for you. I mean, wouldn’t it be hypocritical of me, an archaeologist, to shy away from the past? New goal? Reconnect with someone from my past. I totally forgot to post this when it actually happened. 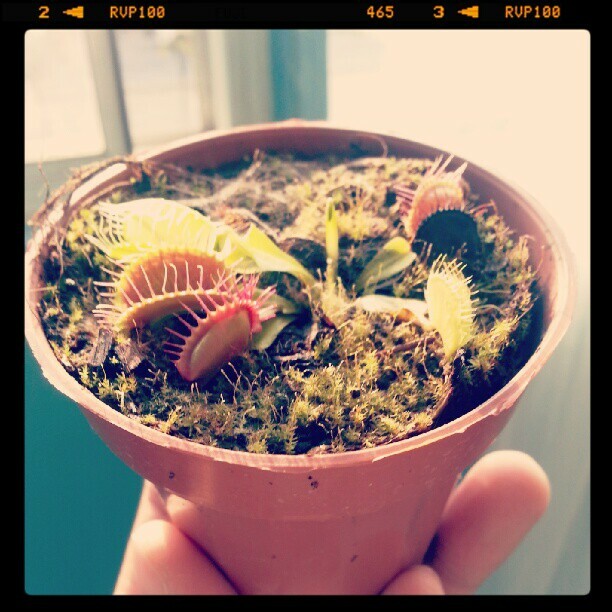 I’ve always wanted a carnivorous plant and jumped on the opportunity to get one! Krista, one of my room mates, named her Mabel. For the first time in my life, at least since I can remember, I’m not perpetually busy. Thoughts of what I need to do next are not constantly running through my head. I’m not physically and emotionally exhausted. I’m not bogged down by work. In fact, since September, I’ve beent he exact opposite. Not to say I’m unoccupied or out of action; but instead in a position privy to a bit more leisure than I am accompanied to. How you may ask did I get this “freedom”? It’s quite simple. My master of science graduate program requires a specific number of courses completed in addition to a masters research paper/thesis. I am very passionate about my chosen career, archaeology, and wanted to devote as much time as possible to the research component of my degree. This being said, I completed the majority of my course work (with the exception of a half credit) in my first year. In doing so, I put an immense amount of pressure upon myself, my relationship (which failed), and my social life. In hindsight it may not have been a good gamble, but I was able to persevere regular anxiety attacks/stress and come out a much better person. This being said, I’ve found myself with my last course NEXT semester, leaving me with this current one off. Now, I’m not necessarily sitting here idle like the title of my post implies. My focus has shifted to the development of my PhD applications, my masters research, and the completion of a new round of grant proposals (I was successful in attaining one for the 2012-2013 academic year!). Indeed, while not even close to as busy as I used to be, I’ve found myself enjoying this new found lifestyle. Although it felt very strange, I eventually adjusted. In fact, I seem to have become more productive. My sleep schedule has become quite regular now. I wake up at a reasonable time, have breakfast while checking the internet essentials (twitter, wordpress, facebook, youtube, etc. ), and get right to work on my research (with interspersed errands). I’ve become wonderfully productive! It actually seems like I’m busy, but it hasn’t taken any sort of negative toll on me. With self-reflection, regular exercise, a complete diet, and embracing new challenges and novelty, I’ve managed to inject my life with the right balance of order and spontaneity. What have I learned? It’s alright not to be busy! In fact, being busy doesn’t necessarily equate to productivity! Adventure antiquing and go longboarding! As some of you may know, I’ve come back to visit Corning, NY with my family. We’re friends with a local historian and come down to visit his family and hike the gorges of the Finger Lakes. My dad and I are also avid collectors. While I have a deep appreciation for knifes (historical and modern) and comic books, he specializes in Art Nouveau glass. We have a really great time browsing stores and seeing the homes of fellow collectors. Antiquing itself can be an adventure! The thrill of walking into a cluttered shop (my favorite type) and unearthing something special from within a seemingly forgotten pile of bric-a-brac is quite something. It’s true that one must have an appreciation for the present; for what comes daily. Rediscovering the past really helps with this. What have I discovered? Today I picked up a very torn copy of a New York county newspaper announcing the death of Adolf Hitler! I was also given a Cattauragus 225 Quartermaster WWII combat knife as a gift! Holy crap eh?! But, as I’ve written on countless occasions, although the stability of routine can be good for our mental health, so is spontaneity. And this will take different forms depending on the individual. For me it’s what a loosely call “adventure”. But what does that really entail? It’s quite simple, all I want to do is step outside my comfort zone into the unknown. Do something different (maybe wild) and explore the world around me. Why? To find myself. Since learning how to longboard and moving downtown, the way I’ve start to see the world around me has changed. 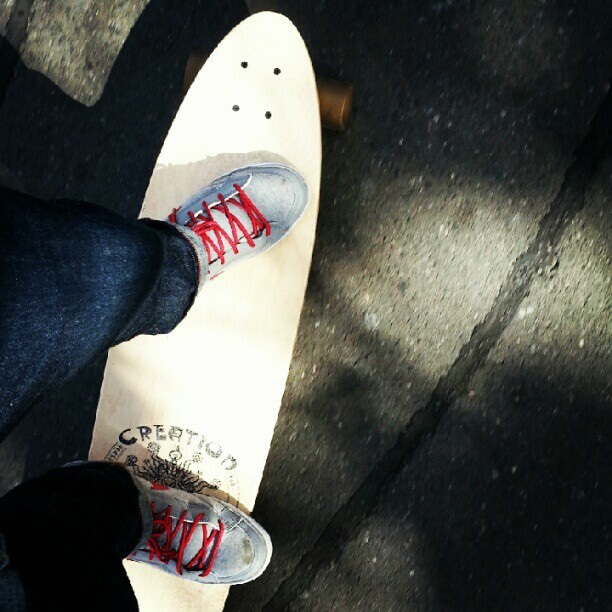 Instead of streetcars and the subway, longboarding and cycling have become my primary modes of transportation (aside from walking). I’ve lived in Toronto for my entire life so far. In doing so, one would think that the city would never feel foreign. However, travelling different (and now accessible) streets of my city on my bike or longboard has really shown me how much there really is to STILL see. Everyday has become an adventure now! New shops, interesting graffiti, previously unexplored restaurants, and who knows what else await me every day! Lesson of the day? Turn your commute into an adventure! Explore your city! Who knowns what you might find (just don’t get hurt).